One of three locations of a small chain specialising in, yep, Champagne and cheese. 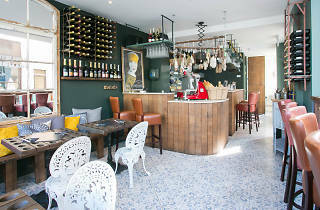 Shop and bistro, Champagne + Fromage brings rustic fare and fizz to London, served the French way. Menu highlights include the cheese and charcuterie boards, baked cheeses, melted cheese... all served the french way. Find the one you like and pair it with a glass of your favourite Champagne. The clue is definitely in the name with this one - it specialises on two absolute greats - cheese and champagne. And I don't mean your cheap as cheeses and mediocre champagnes oh no. They have the most amazing selection. Price for champagne by the glass start at £9, but you can get a trio of glasses for £25, which is certainly reasonable. As for the cheese, oh god where do I begin. As a party of two, we were drawn to the £25 fondue for two, and we were not disappointed. A huge bubbly melted baked cheese, crowned with generous slices of garlic, was presented on a rustic board with roasted new potatoes and a huge pile of cured meat to dip in it. They also give you plenty of bread to mop it all up as well. We went on a Saturday evening, and booked a table which I would highly recommended. When we got there at 5pm it was already packed out, and plenty of people were walking in and out during our meal in the hopes of grabbing a table! If the name doesn’t say it all, the focus here is on two of the greatest things in the world: champagne and cheese. The Greenwich branch might just be my favourite, as the size of the place and the great atmosphere of the area just next to Greenwich Market make for a very cozy setting. The champagne selection is great and what I really like is that you can order a tasting menu of three different champagnes by the glass (the Champagne Tasting Flight), which allows you to taste three great champagnes instead of having to go for one specific one by the bottle. If you are not in the mood for champagne but still end up here, you can have a really good red wine from Bordeaux or Pale Ale instead. The selection of cheeses is also very good and there is something for every taste. I do recommend that you ask the very friendly staff for help in choosing your cheese selection, as they are great in recommending just the right kind depending on the champagne you are ordering. We went for a recommended hard cheese, a blue cheese, a goat’s cheese and a soft and creamy cheese which were served with grapes and slices of fresh baguette. They all accompanied our champagne perfectly! Do you love cheese? What about Champagne? Chorizo? If you like all or any of the above this is the place for you. I’ve tried to most amazing ‘goats cheese’ combined with an delicious chorizo with olive flavour and the smooth champagne #yummy. 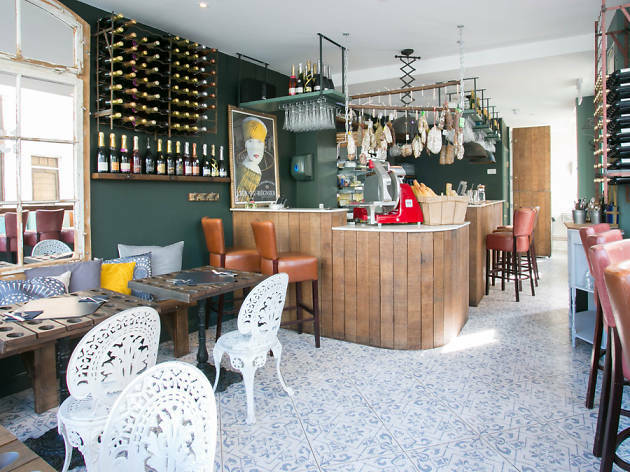 Champagne + Fromage already boasts two locations in the capital, one in Covent Garden and one in Brixton. The Greenwich restaurant and bistro opened its doors in June 2015, on the threshold of Greenwich market, and offers a concise and authentically French menu of sharing boards, terrines, rillettes and confits. Rustic boards showcase a princely range of cheese and meats and are a visual splendour- we ordered the gourmet board, a steal at £25 and generously portioned for two diners. Staff provided an overview of each component, which included three cheeses: one was treated with a champagne wash during fermentation, one was a bold tasting soft cheese and the last was a mild, hard cheese made from a blend of sheep and goat’s milk. There were three varieties of cured meats, freshly shaved at the counter and delicately arranged. The addition of a coronet of rillettes, a scattering of pickles, pots of tapenade and a basil cream added just the right level of gastronomy. The board was accompanied with a side of finely sliced French bread to liberally slather with the tapenades, which stood on their own merits as punchy, flavoursome counterpoints to the cheese and meat. The fig tapenade was fantastic- we were disappointed to find that we couldn’t buy it, as it was sourced directly from a supplier in France and the manager had very limited stock. The champagne list is extensive, but it was a school night and we kept to beer and wine. I enjoyed a good quality and reasonably priced house red with a velvety finish and there was an IPA available from Hop Stuff, a local craft brewery based just down the road. For those hunting for worthy champagne, Champagne + Fromage carry examples from 25-award-winning growers and offer some appealing champagne-infused cocktails too. The restaurant itself is charming, offering several small tables and a counter for diners and making everyone feel very welcome. The staff were all polite and French and the Manager was exceptionally accommodating and conversant in his produce- he allowed us to sample some of the cheeses at the counter and we left with a full arsenal. We’re well on a way to an unbeatable cheeseboard this Christmas! Cosy ambience, excellent and attentive service and a delicious (if somewhat indulgent) menu makes this new addition to this mini-chain worth a visit. Be warned that the menu at this location varies from the other branches and vegetarians might struggle with the options. The omission of a selection of tartines is also lamentable. But all can be forgiven with another perfectly paired glass of fizz and liberal portion of fine cheese.